Born and raised in New Orleans, James Tompkins (“Jim”) learned early in life that hard work, determination, and integrity could also be mixed with enjoying life. These are lessons he has carried with him throughout his long career as a successful trial attorney and entrepreneur. As one of the four founding partners of Galloway, Jim’s forty-six-year–old practice emphasizes admiralty and maritime law, oil and gas law, insurance defense and insurance coverage issues, products liability, property damage, environmental and toxic tort litigation, general casualty litigation, professional liability defense, subrogation, and corporate law. Jim’s insurance defense experience also includes handling auto, trucking, heavy machinery, and industrial casualty matters. Within these areas, Jim has litigated hundreds of cases, many of which were tried to either verdict or judgment. Approximately one-fourth of these cases were jury trials, and approximately two-thirds of them were in Federal Court. He has been the lead attorney in approximately forty opinions published by the Fifth Circuit Court of Appeals, the Eleventh Circuit Court of Appeals, and the district and appellate courts of Texas and Louisiana. After graduating from Louisiana State University in 1968 with his B.A and an officer’s commission from the U.S. Marine Corps, Jim’s active duty was delayed while he attended law school at L.S.U. He earned his J.D. there in 1971 and then reported to the Marine Corps’ Basic School for combat training, from which he graduated with honors. He served most of his three years of active duty with the rank of Captain and was assigned to work in the Navy Judge Advocate General’s office. There, he drafted a complete civil and criminal code for Midway Island, which was approved by the Secretary of the Navy and enacted, with Congressional approval in 1975. Jim’s civilian legal career began in 1974, and he concentrated his efforts in the areas of admiralty and maritime law, principally as defense trial counsel, where he achieved early and accelerated success. In 1987, James Tompkins became one of the four founding shareholders as well as the Managing Director of Galloway in New Orleans. In 1993, the firm expanded from New Orleans to Houston, and Jim became the managing director of the Houston office. 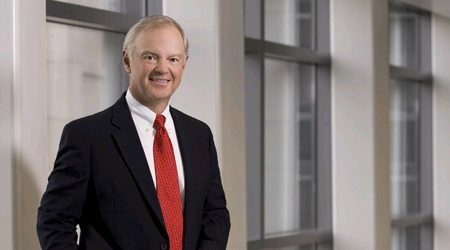 While he continued to lead the Houston office (which grew significantly over the years) until 2015, he returned to the duties as Managing Director of the firm in January of 2006 for a 3-year stint. Now the firm has eleven offices in all Gulf States, and in Atlanta and St. Louis, employing over 100 lawyers and their support staffs. In recognition of Jim’s excellence in practice over the years, he has received a Martindale Hubbell “AV Preeminent” rating, a peer review signifying an attorney who has achieved the highest level of professional skills and ethics. Jim has also been recognized as one of the Nation’s Best Admiralty Lawyers and as a Top New Orleans Lawyer for 2014, 2015. Jim has also been selected by his peers for inclusion in The Best Lawyers in America in 2013, 2014, 2015, 2016, 2017, and 2018 for Admiralty and Maritime Law and again selected by his peers for inclusion in Texas Lawyer’s “Top Lawyers of Texas”. In 2016, he was named in the top 1% of “America’s Most Honored Professionals” by American Registry. Both a leader and a strategic partner, Jim has a knack for helping clients discern opportunities and make connections which add value to their companies. It takes balance to keep a ship afloat, and Jim’s approach to life, coupled with his legal acumen, have given him the ability not only to balance the ship, but keep it moving in the right direction! After 30 dedicated years to the firm, Jim Tompkins retired in December 2017.